The comparison between the Uno and Due isn’t quite fair. The Due runs on an 84 MHz, 32 bit ARM Cortex-M3 processor. It’s in a different league from the Uno. Still, we view this as an example of the extended possibilities from stepping up into a significantly faster micro. For instance, the video is output to both an ILI9341 TFT screen and external 8-bit VGA at once. Besides using some very nice (standard) libraries for the parts, it doesn’t look like [DrNCX] had to resort to any particular trickery — just a lot of gamer-logic coding. All the code is up on GitHub for you to check out. Can the old Arduinos do this? For comparison, the best Pacman we’ve seen on an AVR platform is the ATmega328-based RetroWiz, although it is clocked twice as fast as a stock Uno. And then there’s Hackaday Editor [Mike Szczys]’s 1-Pixel Pacman, but that’s cheating because it uses a Teensy 3.1, which is another fast ARM chip. People always ask where the boundary between an 8-bit and 32-bit project lies. Is a decent Pacman the litmus test? You never know where a hack will take you. Sometimes a simple project will take on a life of its own and become a huge software framework. Other times, a reading blog can turn into a weekend project. Hackaday.io is the place to upload every project, big, small, or somewhere in between. This week on the Hacklet, we’re taking a look at two projects – one big, one small. [Rand Druid] recently spent a Weekend on the Dark Side, creating an ESP8266 packet injector. 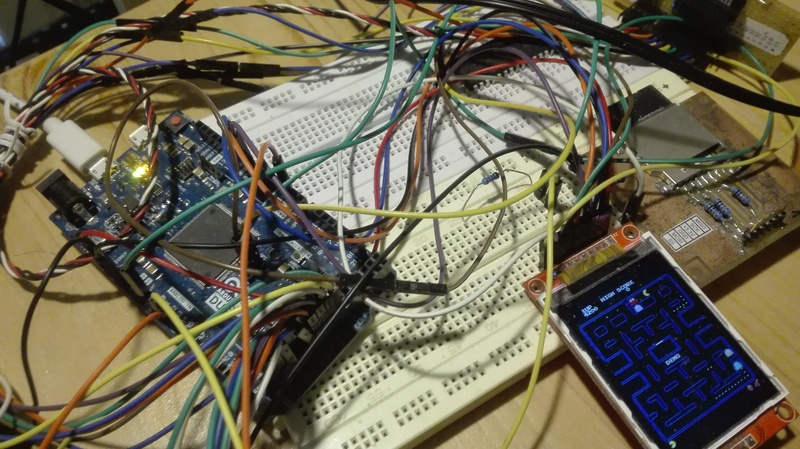 The project started when [Rand] read about [Kripthor’s] deauth packet injection attacks right here on Hackaday. He initially created the WiFi denial of service throwie mentioned in the article. The basic Bill of Materials (BOM) for this device is an ESP8266 module, a DC/DC converter, a 9V battery, connectors, and a few resistors. This worked well, but some devices (most notably [Rand’s] son’s Android Phone) would disconnect and reconnect so quickly the attack had no practical impact. [Rand] fixed the problem by adding a second ESP8266 module. The first is the listener. It listens for WiFi access points. Once an AP is found, it sends this information to the second jammer” module via a unidirectional single line serial link. The jammer module pumps out deauth packets at full speed. He even managed to create a single executable which performs as both listener and jammer. At boot, the software sends out a series 0xFF bytes through the serial port. The listener has its serial transmit pin directly connected to the jammer’s serial receive line. When the jammer receives the 0xFF bytes, it jumps into the correct function. This was more than enough to kick that pesky Android phone off the network. As with the original article, we have to stress that you should only use modules like these for testing on your own equipment. Be careful out there folks! [Kevin Harrington] loves robots, but hates reinventing the wheel every time he creates a new machine. He’s built BowlerStudio: A robotics development platform to combat this problem. BowlerStudio was a semifinalist in the 2015 Hackaday Prize. BowlerStudio is a soup-to-nuts platform for creating all sorts of robots. [Kevin] has integrated Computer Aided Design (CAD), 3D modeling, kinematics, machine vision, and a simulation engine complete with physics modeling into one whopper of a software package. To prove how versatile the system is, he designed a hexapod robot in the CAD portion of the program. The robot then taught itself to walk in the simulation. Once the design was 3D printed, the real robot walked right off the bread board. [Kevin] linked the hardware and software with DyIO, another of his projects. BowlerStudio is a huge boon for just about any robotics hacker, as well as educators. An entire curriculum could be created around the system. Thanks to its Java roots, BowlerStudio is also a multi-platform. [Kevin] has binaries ready to go for Windows, Mac, and Ubuntu. That’s it for this week’s Hacklet. As always, see you next week. Same hack time, same hack channel, bringing you the best of Hackaday.io! This is My 3D Printed Brain! This hack is a strange mixture of awesome and ghoulish. [Andrew Sink] created a 3D printed version of his brain. He received a CD from an MRI session that contained the data obtained by the scan. Not knowing what to do with it he created a model of his brain. Out of a number of images, some missing various parts of his head, he selected the one that was most complete. This image he brought into OisriX, a Mac program for handling DICOM files. He worked on the image for an hour dissecting away his own eyes, skull, and skin. An STL file containing his brain was brought over to NetFabb to see how it looked. There was still more dissection needed so [Andrew] turned to Blender. More bits and pieces of his skull’s anatomy were dissected to pare it down to just the brain. But there were some lesions at the base of the brain that needed to be filled. With the help of [Cindy Raggio] these were filled in to complete the 3D image. The usual steps sent it to the 3D printer to be produced at 0.2 mm resolution. It only took 49 hours to print at full-size. This brain was printed for fun, but we’ve seen other 3D printed brain hacks which were used to save lives. How many people do you know that have a spare brain sitting around? We’ve seen rumors floating around the Twittersphere about a new integrated microprocessor and WiFi SOC: the NL6621 from Nufront. Details are still scarce, but that doesn’t seem to be because the chip is vaporware: you could buy modules on Taobao.com and eBay right now for between two-and-a-half and three bucks, and Nufront’s website says they’ve produced a million modules since 2013. The NL6621 WiFi SOC is powered by a 160 MHz ARM Cortex-M3 with 448 KB of RAM, and everything else is integrated in the SOC. The module has 32 GPIOs, SPI, I2C, I2S digital audio, and most of the peripherals that you’d expect. They say they have a completely open source SDK, but we can’t find a link to it anywhere. An English-language forum has sprung up in anticipation of the next new thing, and they say that they’ve contacted Nufront about the SDK, so that’s probably as good a place as any to lurk around if you’re interested. With an ARM core, it shouldn’t be long before someone gets GCC working on these things anyway. It’s also worth noting that we’ve announced ESP8266 killers before, and it hasn’t come to pass. The mixture of community and official support that (eventually) came out of Espressif seems to be the main factor determining the ESP8266’s success, and we don’t see that yet with the NL6621. So take the question mark in the title seriously, but if this turns out to be the next big thing, remember where you heard it first, ok? Thanks [David Hunt] for the tip! Is Your Cat 6 Ethernet Cable Cat 6? Probably Not. Though we’ve never used their cables, [Blue Jeans Cable] out of Seattle, WA sure does seem to take the black art of cable manufacture seriously. When they read the Cat 6 specification, they knew they couldn’t just keep building the cables the way they used to. So they did some research and purchased a Fluke certification tester for a measly 12,000 US dollars. While they were purchasing the device, they ran across an interesting tidbit in the fluke knowledge base. Fluke said that 80% of the consumer Cat 6 cables they tested didn’t begin to meet the Cat 6 specification. This is the part where [Blue Jeans Cable] earns our respect; like good scientists, they set out to replicate Fluke’s results. Sure enough, 80% of the Cat 6 cables they tested from big box stores etc. failed the specification. More surprising, many of them didn’t even pass the Cat 5e specification. [Blue Jeans Cable] asserts that this is possible because the Ethernet cable specification is policed via the honor system, allowing manufacturers to be fairly brazen about what they label as Cat 6.